This article is about the film. For the television series based on the film, see School of Rock (TV series). For other uses, see School of Rock (disambiguation). School of Rock is a 2003 comedy film directed by Richard Linklater, produced by Scott Rudin, and written by Mike White. The film stars Jack Black, Joan Cusack, White, and Sarah Silverman. 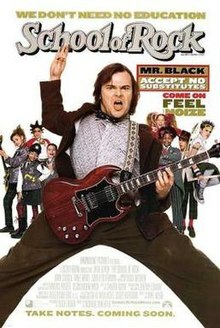 Black plays struggling rock guitarist Dewey Finn, who is kicked out of his band and subsequently disguises himself as a substitute teacher at a prestigious prep school. After witnessing the musical talent of his students, Dewey forms a band of fourth-graders to attempt to win the upcoming Battle of the Bands and pay off his rent. School of Rock was released on October 3, 2003, by Paramount Pictures, grossing $131 million worldwide on a $35 million budget. The film received positive reviews from critics, with praise for Black's performance. It was the highest grossing music-themed comedy of all time, until it was overtaken in 2015 by Pitch Perfect 2. A stage musical adaptation opened on Broadway in December 2015, and a television adaptation for Nickelodeon premiered on March 12, 2016. No Vacancy, a rock band, performs at a nightclub three weeks before auditioning for the Battle of the Bands competition. Guitarist Dewey Finn creates on-stage antics, including a stage dive that abruptly ends the performance. The next morning, Dewey wakes in the apartment he lives in with Ned Schneebly and his girlfriend, Patty Di Marco. They inform Dewey he must make up for his overdue share of the rent or move out. When Dewey meets No Vacancy at a rehearsal session, he finds out that he has been replaced by another guitarist named Spider. Later, while attempting to sell some of his equipment for rent money, Dewey answers a phone call from Rosalie Mullins, the principal of the Horace Green prep school, inquiring for Ned about a short-term position as a substitute teacher. Desperate for money, Dewey impersonates Ned and is hired. On his first day at the school, Dewey adopts the name "Mr. S" and spends his first day behaving erratically, much to the class's confusion. The next day, Dewey overhears a music class and devises a plan to form them into a new band to audition for Battle of the Bands. He casts Zack Mooneyham as lead guitarist, Freddy Jones as drummer, cellist Katie on bass, pianist Lawrence on keyboard, and himself as lead vocalist and guitarist. He assigns the rest of the class to various roles of backup singers, groupies, roadies, with Summer Hathaway as band manager. The project takes over normal lessons, but helps the students to embrace their talents and overcome their problems. He reassures Lawrence, who is worried about not being cool enough for the band, Zack, whose overbearing father disapproves of rock music, and Tamika, an overweight girl who is too self-conscious to even audition for backup singer despite an amazing voice. During one eloquent lesson, he teaches the kids that rock and roll is the way to "Stick it to the Man" and stand up for themselves. Band "groupies" Michelle and Elena, with Summer's approval, pitch the band name "The School of Rock." Two weeks into his hiring, Dewey sneaks his key band members out of school to audition for a spot in the competition, while the rest of the class stay behind to maintain cover. When Freddy wanders off, Dewey retrieves him but the group is rejected because the bill is full. After Summer tricks the staff into thinking that they have a terminal illness, the band is auditioned. The next day, Mullins decides to check on his teaching progress, forcing Dewey to teach the actual material. Mullins explains that a parents' night will take place at the school the day before Battle of the Bands, rendering Dewey concerned. As Dewey prepares for the parents' night, Ned receives a paycheck from the school via mail, realizing that Dewey impersonated him. During the parents' meeting, the parents question what Dewey was teaching the kids until Ned, Patty, and the police confront Dewey. With Mullins bursting in to question what is going on, Dewey reveals his true identity, admits he is not a licensed teacher and flees to his apartment where he and Patty later argue. Ned intervenes and informs Dewey he should move out. The next morning, the parents go on an uproar in front of Mullins at her office, while the kids decide not to let their hard work go to waste. When the new substitute discovers that the kids are missing, she informs Mullins, and Mullins and the parents race to the competition. Ned, constantly bossed around by Patty, finally stands up for himself and leaves to see the band perform. A school bus comes to pick up Dewey, who leads the kids to the Battle of the Bands and decides that they play the song written by Zack. Initially dismissed as a gimmick, the band wins over the entire crowd. Much to Dewey's dismay, No Vacancy wins, but the audience chant for School of Rock and demand an encore. Some time later, an after school program known as the School of Rock has opened as Dewey continues to coach the students he played with before while Ned teaches beginners. Screenwriter Mike White's concept for the film was inspired by the Langley Schools Music Project. Jack Black once witnessed a stage dive gone wrong involving Ian Astbury of rock band The Cult, which made its way into the film. Many scenes from the movie were shot around the New York City area. The school portrayed in School of Rock is actually Main Hall at Wagner College in Staten Island, New York. In the DVD commentary, the kids say that all of the hallway scenes were shot in one hallway. One of the theaters used in many of the shots was at Union County Performing Arts Center located in Rahway, New Jersey. The eponymous album was released on September 30, 2003. Sammy James Jr. of the band The Mooney Suzuki penned the title track with screenwriter Mike White, and the band backed up Jack Black and the child musicians on the soundtrack recording of the song. The film's director, Richard Linklater, scouted the country for talented 13-year-old musicians to play the rock and roll music featured on the soundtrack and in the film. The soundtrack includes "Immigrant Song" by Led Zeppelin, a band that has rarely granted permission for use of their songs in film and television. Linklater came up with the idea to shoot a video on the stage used at the end of the film, with Jack Black begging the band for permission with the crowd extras cheering and chanting behind him. The video was sent directly to the living members of Led Zeppelin, and permission was granted for the song. The video is included on the DVD. School of Rock received an approval rating of 91% on Rotten Tomatoes based on 195 reviews with an average rating of 7.7/10. The site's critical consensus reads, "Black's exuberant, gleeful performance turns School of Rock into a hilarious, rocking good time." On Metacritic, the film has a score of 82 out of 100, based on 41 critics, indicating "universal acclaim". School of Rock opened at #1 with a weekend gross of $19,622,714 from 2,614 theaters for an average of $7,507 per venue. In its second weekend, the film declined just 21 percent, earning another $15,487,832 after expanding to 2,929 theaters, averaging $5,288 per venue, and bringing the 10-day gross to $39,671,396. In its third weekend, it dropped only 28 percent, making another $11,006,233 after expanding once again to 2,951 theaters, averaging $3,730 per venue, and bringing the 17-day gross to $54,898,025. It spent a total of six weeks among the Top 10 films and eventually grossed $81,261,177 in the United States and Canada and another $50,015,772 in international territories for a total gross of $131,282,949 worldwide, almost four times its budget of $35 million. This made School of Rock the highest-grossing music-themed comedy of all time, until it was overtaken in 2015 by Pitch Perfect 2. The film was nominated for several awards, including Black receiving a Golden Globe Award nomination for Best Actor – Comedy or Musical (which he lost to Bill Murray for Lost in Translation), and winning an MTV Movie Award for Best Comedic Performance. In 2008, Jack Black said that a sequel was being considered. It was later reported that director Richard Linklater and producer Scott Rudin would return. Mike White was returning as screenwriter for the sequel, titled School of Rock 2: America Rocks, which picks up with Finn leading a group of summer school students on a cross-country field trip that delves into the history of rock 'n' roll. In 2012, Black stated that he believed the sequel was unlikely, saying, "I tried really hard to get all the pieces together. I wouldn't want to do it without the original writer and director, and we never all got together and saw eye-to-eye on what the script would be. It was not meant to be, unfortunately," but added, "never say never". On April 5, 2013, Andrew Lloyd Webber announced that he had bought the rights to School of Rock for a stage musical. On December 18, 2014, the musical was officially confirmed and it was announced that the show would receive its world premiere on Broadway in autumn 2015, at the Winter Garden Theatre. The musical has a book by Downton Abbey creator Julian Fellowes, and is directed by Laurence Connor, with choreography by JoAnn M. Hunter, set and costume design by Anna Louizos and lighting by Natasha Katz. The musical features an original score composed by Lloyd Webber, with lyrics by Glenn Slater and sound design by Mick Potter, in addition to music from the original film. School of Rock became Lloyd Webber's first show opening on Broadway before London since Jesus Christ Superstar in 1971. On August 29, 2013, a 10-year anniversary screening of the film was held in Austin, Texas, at the Paramount Theatre. Those in attendance included director Richard Linklater, Jack Black, Mike White, Miranda Cosgrove and the rest of the young cast members, except for Cole Hawkins (who played Leonard). The event, hosted by the Austin Film Society and Cirrus Logic, included a red carpet, a full cast and crew Q&A after the screening, where the now-grown child stars discussed their current pursuits in life, and a VIP after-party performance by the School of Rock band during which "School of Rock", "The Legend of The Rent", "Step Off" and "It's a Long Way to the Top (If You Wanna Rock 'n' Roll)" were played. On August 4, 2014, Nickelodeon announced that they were working with Paramount Television on a television show adaptation of the film. Production started in the fall and the series premiered in 2016. It starred Breanna Yde, Ricardo Hurtado, Jade Pettyjohn, Lance Lim, Aidan Miner, and Tony Cavalero.. It ran from March 12, 2016 to April 8, 2018 for a total of 3 seasons. ^ "SCHOOL OF ROCK (PG)". British Board of Film Classification. October 8, 2003. Retrieved May 6, 2013. ^ "The School of Rock (EN)". Lumiere. Retrieved June 26, 2017. ^ "School of Rock (2003)". Box Office Mojo. IMDb. Retrieved August 31, 2013. ^ a b "List of Top Grossing Music Comedy Films, 1984-Present". Box Office Mojo. Retrieved August 7, 2014. ^ "'School of Rock' musical opening on Broadway in 2015". Los Angeles Times. December 18, 2014. Retrieved January 1, 2015. ^ "Jack Black Interview, indielondon, Q and A". IndieLondon.co.uk. Retrieved February 22, 2014. ^ Balsamini, Dean (September 7, 2008). "Wagner College to celebrate 125th anniversary". Staten Island Advance. Retrieved December 9, 2009. ^ "School of Rock (2003)". Rotten Tomatoes. Flixter. Retrieved August 31, 2013. ^ "School of Rock (2003)". Metacritic. CBS Interactive. Retrieved August 31, 2013. ^ Munoz, Lorenza (October 6, 2003). "'School of Rock' opens with honors". latimes. ^ "Jack Black to return to class for School of Rock sequel". Adfero.co.uk. July 14, 2008. Archived from the original on September 3, 2011. Retrieved July 15, 2008. ^ Siegel, Tatiana (July 13, 2008). "Paramount goes back to School". Variety. Retrieved July 15, 2008. ^ Tyler, Josh (July 14, 2008). "Jack Black Set for School of Rock 2". CinemaBlend.com. Retrieved July 15, 2008. ^ "JACK BLACK PLANNING SCHOOL OF ROCK REUNION". Hollywood.com. October 3, 2012. Retrieved August 31, 2013. ^ "Andrew Lloyd Webber to stage School of Rock musical". BBC.co.uk/news. BBC News. April 10, 2013. Retrieved September 7, 2013. ^ "Andrew Lloyd Webber to stage School of Rock". TheGuardian.com. The Guardian. April 8, 2013. Retrieved September 7, 2013. ^ "Andrew Lloyd Webber To Bring SCHOOL OF ROCK To The Stage". Broadwayworld.com. Retrieved March 8, 2014. ^ Cox, Gordon (December 18, 2014). "'School of Rock' Will Rock Broadway with Andrew Lloyd Webber". variety.com. Variety. Retrieved January 1, 2015. ^ "Andrew Lloyd Webber kicks out the jams with School of Rock musical". theguardian.com. The Guardian. December 19, 2014. Retrieved December 29, 2014. ^ "Andrew Lloyd Webber's School of Rock Will Shake Up Broadway Next Fall". playbill.com. Playbill. December 18, 2014. Retrieved December 29, 2014. ^ "'The School of Rock' to be adapted into Broadway musical". nydailynews.com. Daily News. December 18, 2014. Retrieved December 29, 2014. ^ "Andrew Lloyd Webber's School of Rock to open on Broadway next December". thestage.co.uk. The Stage. December 19, 2014. Retrieved December 29, 2014. ^ "School of Rock Musical To Have World Premiere On Broadway!". reallyuseful.com. Really Useful Group. December 18, 2014. Retrieved December 29, 2014. ^ "Andrew Lloyd Webber Will Pen Tunes for School of Rock Musical". time.com. Time Magazine. December 18, 2014. Retrieved December 29, 2014. ^ "Andrew Lloyd Webber's School of Rock will open on Broadway this year". londonboxoffice.co.uk. London Box Office. January 14, 2015. Retrieved January 16, 2015. ^ Matthew, Jacobs (August 30, 2013). "'School Of Rock' Reunion Brings Jack Black, Miranda Cosgrove, Richard Linklater And More Together 10 Years Later". Huffingtonpost.com. Retrieved March 8, 2014. ^ "'School of Rock' cast including Jack Black, Miranda Cosgrove reunites for 10 year anniversary". New York: NY Daily News. August 30, 2013. Retrieved March 8, 2014. ^ ""Long Way To The Top" - School of Rock Reunion Concert LIVE". Retrieved November 21, 2016. ^ "'School of Rock TV Series Coming to Nickelodeon". roosterteeth.com. August 4, 2014. Retrieved August 4, 2014. ^ Elizabeth Wagmeister (March 26, 2015). "'School of Rock' Series: Nickelodeon Announces Cast for TV Movie Adaptation - Variety". Variety.